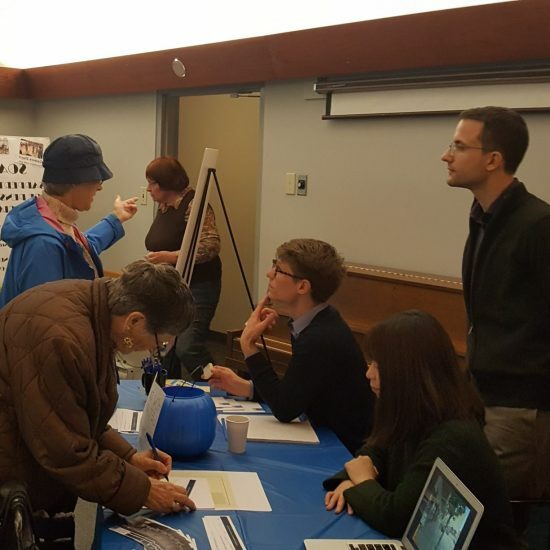 As part of our bconnected initiative, Bunt sponsored and managed a student team at UBC’s School of Community and Regional Planning (SCARP) to deliver a neighbourhood-wide planning and engineering safety study in Uptown for the City of New Westminster. The student team: Mengying Li, Alex Taciuk, and Filippos Gkekas were co-managed by UBC Adjunct Professor Clare Mochrie and Bunt Senior Transportation Planner Dan Ross to provide a year-long, data-intensive safety study explicitly focused on the mobility challenges of seniors as part of their Masters degree’s final capstone project. The project was modeled on similar engineering/design work Dan delivered in New York to very positive results. Dan approached SCARP for the opportunity to undertake this first-of-its-kind project in Canada for the dual purpose of introducing the Lower Mainland to the great benefits of senior-centric projects while also strengthening ties to the university community. As an experienced planner and former teacher, Dan was an early and enthusiastic proponent of bconnected’s potential. The City of New Westminster already has an advanced policy agenda to promote a senior-friendly city and was a logical choice to host the project. With their full support and PM and technical guidance from Clare and Dan, the student team undertook a professional scope of planning and engineering work from Fall 2017 to Spring 2018. The project combined a full suite of qualitative and quantitative data collection to identify streetscape deficiencies and inform over 130 feasible recommendations to provide a neighbourhood streetscape environment for the safer and more comfortable mobility of the senior population – and by extension, everyone. Recommendations included ongoing consultation with both the senior population and the city itself to ensure proposed improvements were both relevant and aligned with current policy objectives and engineering guidelines. After several rounds of iterative comments with the city, the student team separately delivered its final report – Great Streets for Seniors Final Report and presentation – Great Streets for Seniors New Westminster Presentation to their SCARP colleagues, the city’s Seniors and Accessibility committees, and the city Transportation (Planning and Engineering) Department. According to the city’s Transportation Engineering Manager Lisa Leblanc, the report is already being employed by the city to update its capital plan for 6th Street upgrades as well as a comprehensive review of its signalized intersection clearance time practices. Not too bad for a student capstone project. Great Streets for Uptown Seniors is a prime example of the benefits of bconnected and hopefully a catalyst for similar seniors projects throughout Canada. bconnected is a platform that supports the passion of our staff in advancing community well-being, and it is a vehicle to raise awareness of organizations and initiatives driving positivity world-wide. Contact Dan Ross if you are interested in learning about Bunt & Associate’s bconnected program and how it can benefit your community.